Rhizomes 0.5-2 × 0.5-1.8 cm; bulbs 0.6-2.5 cm. Stems 1/4-1/3 floriferous, 0.6-2 m. Leaf blades linear, long-attenuate, 30-80 × 0.6-3.2 cm, apex acute. Inflorescences 1.3-8 dm; terminal raceme 1-2.6 dm; secondary racemes spreading to ascending, 0.2-1.1(-2.2) dm; tertiary racemes infrequent; bracts obovate to subulate, green to brown, 2-4(-6) mm, densely floccose abaxially and marginally. Tepals greenish yellow, aging dark reddish purple, ovate to obovate-oblong, 5.5-13 × 2.2-6 mm, base abruptly auriculate to hastate, clawed, margins entire, apex acute, claws 0.5-1.2(-2.5) mm; glands yellowish green, oblong to oblong-ovate, nectariferous; stamens 6.5-8.5 mm; filaments inserted at or above middle of claw, 0.7-2.5 mm from ovary base, not basally dilated, equaling tepal width at insertion point; anthers 0.9 mm; ovary ovoid, glabrous or pubescent; styles 1.5-3.5 mm; pedicel spreading to ascending, 5-20 mm. Capsules elliptic-ovoid, 10-18 × 6-10 mm, glabrous or glabrate. Seeds 5-8 × 2.5-4 mm (including wings). 2n = 16. Flowering late spring--summer. Bogs, marshes, wet woods, savannas, meadows, along railroads; 10--800 m; Ala., Ark., Del., D.C., Fla., Ga., Ill., Ind., Iowa, Kans., Ky., La., Md., Miss., Mo., N.J., N.Y., N.C., Ohio, Okla., Pa., S.C., Tenn., Tex., Va., W.Va. The clawed tepals of Melanthium virginicum distinguish it from M. parviflorum and M. woodii, which have tepals with gradually attenuate bases. Perennial herb with a thick rhizome flowering stem 0.6 - 2 m tall Leaves: basal, sheathing, elongate, to 0.8 m long and 3 cm wide, linear with a narrowed base and long-pointed tip. Flowers: greenish yellow, becoming dark reddish purple, with six clawed, spreading tepals that have a pair of yellowish green glands at the base. Fruit: a three-lobed ellipsoidal capsule, 1 - 1.5 cm wide. Seeds winged. Inflorescences: are large, hairy clusters (racemes) of both unisexual and bisexual flowers (polygamous). The terminal raceme is 10 - 26 cm long. The secondary racemes are spreading to ascending and 2 - 22 cm long. Habitat and ecology: Rare, probably extirpated from the Chicago Region. 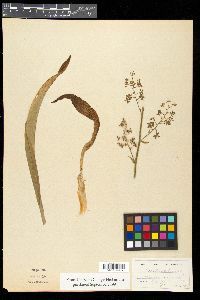 A single specimen was found in a low meadow along a railroad. Typical habitat is meadows and wet prairies. Etymology: Melanthium comes from the Greek words melas, meaning black, and anthos, meaning flower, referring to the darkening of the flowers with age. Virginicum means "of or from Virginia." Rare and very local. My White County specimen was found in a wet prairie habitat a half mile east of Idaville. My Cass County specimen was found in mucky soil in a large swamp about 3 miles northwest of Hoover. I found a single specimen on a springy, gravelly slope in the open at "Crows' Nest" about 8 miles north of Indianapolis. It has also been reported from Franklin and St. Joseph Counties, from the vicinity of New Albany, and from the area of Delaware, Jay, Randolph, and Wayne Counties by Phinney, who assigns it to "wet meadows."